Google is not all about web-based applications, occasionally they also produce an application that is useful locally. Like the updated Google Mobile App for BlackBerry - it searches contacts and emails on your device and you can even search by voice. Think of this as an uber smart dialing - Google Mobile App will search both through the contacts list and through the content of the emails you've received. After you've found the person or email you've been looking for, you're a step away from calling that person or send them an SMS or email, even forward one of the emails from the search. This being a Google-made app, the search algorithms are a bit more advanced than those in the typical smart dialing. The app will put the more frequently contacted people closer to the top of the suggestion list. Google say that all this happens locally and no information about your contacts or emails is sent back to them. You can turn off the on-device searching if you're still not comfortable with it. To search for both email and contacts, your BlackBerry needs to have an OS version 4.5 or higher, contact only search works on OS versions as low as 4.2. The updated Google Mobile App can use your Berry's Wi-Fi connection to avoid data charges. For download and more information on the rest of the Google Mobile App capabilities (My Location, Google Suggest, etc. ), head over to this page. 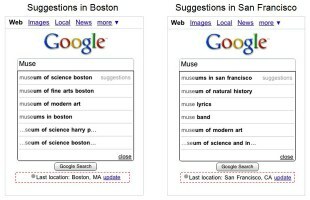 Google tweaked their search results too – now if you open google.com from your Android phone or iPhone, the suggestions that Google offers as you type in your query take into account your location. This is similar to the Near me now feature, but not quite the same. Near me now is intended to help you find your way to the nearest restaurant (for example) from where you are now and show you reviews of people who have visited it. The location-aware searching is a bit more general – maybe you just want to read news about the new exhibits in the city’s museum. Location optimized suggestions are available only in the US for now.